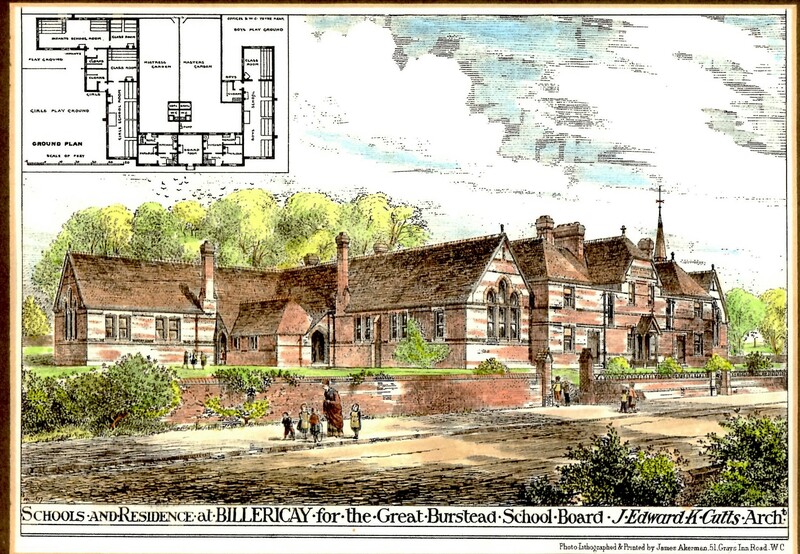 This architect’s impression by J Edward K Cutts is of the then proposed building for Great Burstead School Board. It opened as Great Burstead Board Schools in 1878, when education only up to the age of ten was deemed to be necessary. It had separate girls’ and boys’ schools; replacing a girls’ school in Rose Hall, Chapel Street, and a nearby boys’ school in Laindon Road. Separate quarters, for the master of the boys’ school and mistress (sic) of the girls’ school, linked the two schools. They also had their own separate gardens. Lasting as a school for over a hundred years through several name changes; it eventually became Quilters County Junior and Infant Schools. It is shown here viewed from the southeast; with the proposed girls’ school and their playground beyond the perimeter wall. Over the years several extensions were made including to the left end of the girls’ school and both schools being extended towards the road. Part of the former girls’ school playground was also sacrificed for two additional classrooms with a connecting corridor. This resulted in the two windows facing the playground to the left of this picture overlooking this corridor. When the school was built in 1878, it cost £4,897.10s.0d. It was originally designed with boys occupying the north wing and girls occupying the south wing. When my mother and auntie attended there in the 1920s they were taught in mixed classes so I’m not sure when the gender segregation ended. The central block provided living accommodation for the Head master and Headmistress each with lengthy back gardens complete with outside toilets! The gabled fronts to each wing were extended up to the pavement c.1903 and the change in the colour of the roof tiles between old and new is still visible today. Extensions were built in the interwar years and these are distinguishable by the different style windows and new style cavity brickwork. I attended the school from 1953 to 1959 and after I left a swimming pool was built plus the ubiquitous demountable classrooms.